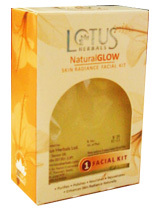 Buy Lotus NaturalGlow Skin Radiance Facial Kit. Purifies Skin, Polishes Skin, Nourishes Skin, Rejuvenates Skin. 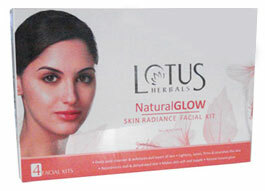 Enhances Skin Radiance Naturally. This unique cleansing milk is ideal for deep cleansing and removing make-up. The astringent property of lemon lifts impurities from the skin. Turmeric works as an antiseptic, maintains moisture level and preserves elasticity of skin. The lemon peel extract draws out younger skin. Apply in dots all over face and neck. Smoothen till skin absorbs it. Before stepping out in the sun, apply in combination with Lotus Safe Sun - Sunscreen lotion/créam/gel. Natural Alpha-Hydroxy Fruit acids act gently to rejuvenate your skin, giving over-stressed skin a new vitality and healthy radiance. Firming, nourishing, hydrating and soothing, this pack is a vital weekly pampering, specially for mature skin, pH balanced. Orange Peel and Swiss Alpine Salt whitening skin polisher is a unique combination of Orange and Alpine Salt which removes toxins, deep cleanses pores as well as lightens your skin tone to provide you with a radiant glow. Gently apply the Orange Peel and Alpine Salt Whitening Skin Polisher on moistened skin with brisk circular movements on the face and neck. Rinse thoroughly and pat dry. USe daily to dextoxify and enhance skin radiance.